Is there a spiritual take on what happened this past weekend in Charlottesville? This is The Wisdom Daily after all. What wisdom is there to be found in the metaphorical ashes left in the wake of what feels like communal devastation? There is a Talmudic teaching that says, “If there is not flour, there can be no learning.” This is to say, learning, contemplation and any form of lofty spiritual journey is not quite attainable if there is no food (flour; nor sustenance) to eat. The talk of meditation, mindfulness and prayer are goals for some. They are not appealing to others. But, when we don’t have our basic physical and existential needs met, then so much of the ethereal doesn’t seem like it matters. And so, that is the emptiness with which I write today. That is the emptiness I felt when I watched television with my mouth agape this past weekend. I wasn’t just angry and scared. I felt morally robbed and spiritually bankrupt. This Nation of ours is certainly not a Higher Power, but I can’t help, perhaps naively so, to ascribe to it, a higher sense of calling, meaning and purpose. I know the divisions amongst us are at a screeching high, but yet, still I expect a degree of protection that at least pretends to care about the rights of all people. Yes, the last few years and especially months, have displayed a certain brand of hatred that has seeped closer to the mainstream than I have experienced in my lifetime. 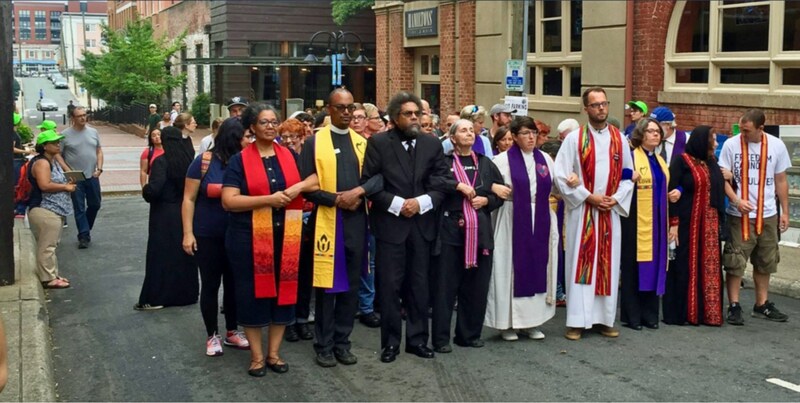 But, this weekend in Virginia felt different because, for too many moments and in too many pauses, it seemed that hate was itself the mainstream. It seemed too permissible for hate speech to be spewed. It felt too allowable for uncontrollable melees of bigotry to break out. It felt like terror was brewing on the sidelines, only to burst into the street of community and take innocent life. Our leaders, not just political, but also communal leaders, waited too long to respond (including myself), many of us frozen in disbelief; paralyzed because our country didn’t look like itself. I have only seen the films of Nazi Germany from the early 1930’s. I wasn’t there. So, I must be careful not to overdramatize. So, perhaps Virginia was not Third Reich Germany. Perhaps, it wasn’t the American South of the 1960’s. But it was closer than it ever should be in 2017 America. I shouldn’t be afraid to be Jewish in 2017 America. My African American nieces should not be scared to be Black in 2017 America. My gay sister should not be frightened to be gay in 2017 America. There are some unalienable rights to equality and safety about which we should just not have to worry. Because when those rights are for grabs, it is almost like being hungry or homeless. Because without those rights we have no place to live and no place to sit down to eat a meal. I don’t think there is more hate than love in this country. I really don’t. But if hate is allowed to be mainstreamed (and I am not against our cherished first amendment), then the fear will only increase. And if fear continues to increase, our community will continue to constrict. And if we continue to constrict, too many will know nothing else, but to combat hate with hate and violence. The room can be made for love when certain bottom lines are declared as norms of our nation. Every one one of us has a right to exist by virtue of who we are simply because we come from the same maker, the same cosmic parent. Our color, orientation, way of practicing life is ours and it is beautiful because it is our truth. All truth has a place. All truth is but a complicated puzzle piece, which, with work and attention, will fit with other pieces and produce an amalgam called connected community. The pieces just don’t fit when we believe they should only come together with those that are exactly the same as ours; when we believe that our pieces are the only acceptable ones out there. Part of the reason I didn’t speak out until today is because I know that every piece of commentary these days is read as political. I try so hard, harder than my congregants understand, not to take partisan positions. I have heard it from all sides because my greatest striving for wisdom comes in doing everything I can to understand all sides of all people. I want to know why people are so angry and polarized in this day and age. I believe it is a spiritual virtue to sit and listen and dig to the heart of the opposite of my innate truth. So, I tend to be more patient than so many would like in my reactions to the spew coming forth from every side of the political and societal spectrum. However, this is different. If we can’t say that hatred and bigotry and supremacy of any kind is unacceptable, then all we are doing is sucking the metaphorical food and shelter out of our communal marrow. Wisdom is a lofty and worthy goal. But, if our basic rights are up for grabs, then attaining wisdom will only be in the realm of the heavens, when really every single one of us deserves the chance to be whole right here on earth.